ENGLEWOOD, Colo., August 9, 2018 (Newswire) -MADSKY MRP Inc. and Panton Inc. today announced the availability of an innovative partnership between the two companies formed to streamline roofing inspections, optimize workflows and provide training to MADSKY's roofing contractor network. Through the partnership, MADSKY contractors gain access to Panton's technology and drone use for roof inspections to fully understand damages, measurement and replacement costs before starting a roof repair. The purpose of drones is to allow contractors and insurance adjusters a safe way to perform inspections from a bird's eye view on steep-slope roofs and massive exteriors to finish their assessments more quickly and accurately than ever. 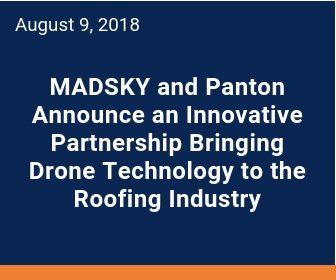 “We are excited to be partnering with MADSKY to provide their contractors with the technology and hail damage reporting tools they need to save time, improve safety and increase overall efficiency when working storm damage claims," said Frank Li, founder and CEO, Panton Inc.
To promote the partnership, Panton is offering a free drone for every 25 reports ordered by MADSKY inspectors. The promotion runs through Dec. 31, 2018.